I’m not gonna lie: I slacked this week. On a color challenge. Don’t worry – I’m disappointed in myself. At least I had fun slacking off. My weekend was filled with spending time with family and I’ve been out and about every night after work. Sorry excuses but it’s the truth. Cross my heart, hope to die, stick a needle in my eye. Well… that sounds a bit extreme but you get the drift. I’ve been busy. Paco to the rescue. And PodMate as these are from her art supply. Out of a box 64 crayons, there are six purple crayons. Seven if you count periwinkle. Eight including lavender (it looks a bit more pink to moi). 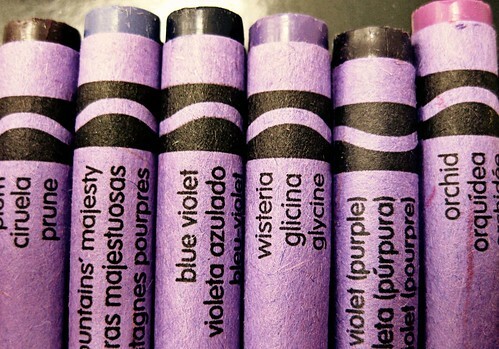 Twelve percent of the crayons are hues of purple. Seems a bit excessive to me but I dig the names: Plum. Purple Mountains’ Majesty. Wisteria. Orchid. There’s already a few purple photos up on the flickr group so go check them out. Next week’s challenge is “hat”. I have some ideas so here’s to hoping I have some down time to actually play with the kahuna. Good luck to the Challengers – only eight more weeks left! 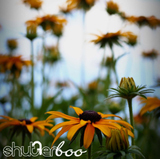 ~ by shutterboo on June 23, 2010.
love it! Mac and Cheese is one of my favorite crayon names ever! When I was a kid they introduced new colors and you could write in and submit your suggestion for a name. Most of the newer names came from kids! I think Crayola still does that. I know I wouldn’t have thought of macaroni and cheese for a crayon. i can’t believe i haven’t commented yet. i really do love this photo. it’s so simple, but it says so much. Si. Very purple. I was a total slacker though. I love this picture! I think it’s adorable, and I never would have thought of it. I grab Susan’s crayons all of the time. Like she should consider charging me two cents every time I reach for them. She’d have that box paid off in no time and the probably be able to buy herself a lunch. The sad thing is I have my own box of crayons. But who wants to mess with a 25 when your neighbor has 64?! They had that naming contest when I was in 2nd grade. Every year I would get a new box of 64 (one year for Christmas I got a crazy box that had 144 crayolas!). People with OCD like to colorize things. I would rearrange all the colors before the first day of school in ROYGBIV order. I remember 2nd grade because that was my first day of school in Georgia and my teacher made a comment about my strangely arranged crayons. They had the new colors that year and I was very pleased particularly about “mountains’ majesty” and “robin’s egg blue”. They were very good additions to my rainbow of colors. Geez. I love crayons. They smell so good. I’m so happy I have a kid now so I won’t have to make excuses for buying crayons and coloring.